Winning is fun! There is nothing like the exhilarating, heart-pounding thrill of watching your horse thunder to victory. And there is pride in successfully managing a horse's career - owning the right horses, picking the right races. That is the fun of the "business of sports." But the Caviart Farms team also recognizes the critically important "sport of business" - that it is just as important to win on the balance sheet as to win on the racetrack. Profit is the ultimate score and it takes financial success to keep owners in the sport year after year. With every successful sport and business there is a strategy -- a search for "an edge," that something that enhances chances for success. Hockey great Wayne Gretzky said that his "edge" was passion, preparation for every game and going "where the puck was going to be," not where it was. Businessman and Mavericks owner Mark Cuban has given his take, "The edge is knowing that while everyone else is talking about nonsense like ... how they know they can be successful, you are preparing yourself to compete so that you will be successful. That's what makes business such an amazing sport. Everyone plays it. Everyone talks about how good they are or will be at it. Just a small percentage are." Dedication, honesty and integrity are the cornerstones of Caviart Farms' business philosophy. Our reputation is everything and every member of the Caviart Farms team has been instructed to be helpful and respectful to clients and to always provide honest and accurate information. 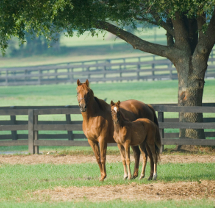 Caviart Farms is the perfect place to raise horses. It has the kinds of highest quality, mineral-rich soils and water that contribute to strong, "hickory-boned horses." And it has Kentucky's famed rolling terrain, particularly advantageous for developing youngsters. We are proud of our status as 'boutique' farm - one that values quality over quantity. 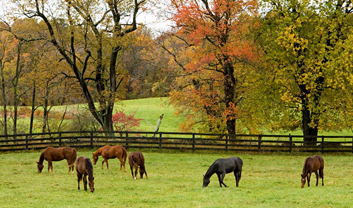 The farm accepts only a limited number of horses so that we can ensure that each horse has ample high-quality space and receives the care that it deserves. Everything at Caviart Farms is thought out and planned in advance by experts in the industry. Our field plan was authored by University of Kentucky experts who studied the fields' soils and plants. The plan directs our pasture management and grazing to ensure proper nutrition for horses in each of the farm's fields and paddocks. Also, the farm is divided into separate "villages" - thereby allowing each team member to focus on a smaller group of horses, and increasing the farm's ability to contain any possible illness. The smaller villages allow us to better tailor a program to fit each horse's individual needs, rather than integrating horses into a "one size fits all" generalized program. Each horse receives maximum day-to-day handling and individualized care. Our barns have been totally restored and renovated - and designed by a professional architect for safety, proper ventilation including dust control (to avoid respiratory problems) and improved lighting. Hay, bedding and feed are stored separate from horse barns reducing dust, and the chances of fire and possible injury to horses. 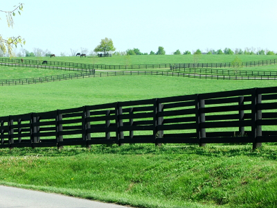 We have also added miles of new, high-quality fencing constructed by the leading fencing company in Kentucky. Caviart Farms' top-quality team of well-trained and experienced people love horses and enjoy their work. They willingly do whatever it takes to provide horses with the very best care, including the occasional long hours in the middle-of-the-night. We supplement our team with the best farm veterinarians from Hagyard Equine Medical Institute who specialize in equine reproduction. In addition, should the need arise, we are in close proximity to two of the world's leading equine veterinary clinics at Hagyard Equine Medical Institute and Rood and Riddle Equine Hospital. Caviart Farms' farrier services are provided by a leading expert in the field - Jim Sammons and Son. This noted farrier begins examining and caring for the feet of every foal on the farm at two-weeks of age. He keeps an eye on them regularly thereafter to constantly ensure proper hoof care and to address and correct any problems early. The entire Caviart Farms team, like Gretzky, is all about preparation and passion. Not every horse will have Gretzky-like talent, but every horse leaving Caviart Farms for training will have received the level of attention and care to give it its best shot at success!